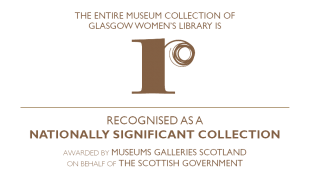 Being a Scottish-born Muslim, and generation three of Pakistani families settled in Glasgow, our BME Development Officer, Syma Ahmed, had the pleasure of developing the BME Women’s History Project at the Library. The project captures and documents the stories of migrant communities, particularly women, and celebrates how they have enriched the City of Glasgow by bringing with them their distinct cultural heritages, traditions, faiths and cultures. This also includes documenting the history of BME women’s organisations and projects that have been set up in Glasgow. An associated publication She Settles in the Shields will soon be published. Based on our travelling exhibit of the same title, She Settles in the Shields explores the stories of women who travelled to Scotland from all over the world in search of family, love and security. This is an ongoing project at the library: we have worked with South Asian and Chinese women, and are very keen to work with other diverse groups within Glasgow. The monthly BME-themed film night aims to screen thought-provoking films every month that raise issues relevant to BME women. The film screening is followed by an informal discussion where women are able to express their thoughts about the matters raised within the film. Women have opportunities to view films for free (many films include those not usually shown in mainstream cinema) in a women-only, safe and secure environment. As well as the social interaction, women enjoy the treats provided such as popcorn, nachos and soft drinks. We would be happy to hear your suggestions for future film night screenings. This is an artistic project that helps women to create individual life books using scrap booking techniques. After discussion with fellow workers in the Glasgow community working with BME communities, it was identified that many BME women, especially those who have migrated to this country, did not get as much opportunity for self development due to a number of reasons including family responsibilities; unaware of available opportunities; lack of culturally competent services; language barriers etc. Therefore the project aims to raise the confidence and self esteem of the participants in a fun and creative way. The women are encouraged to reflect on their life history, acknowledge their skills and experience, explore their interests and ambitions and mark their achievements. These are incorporated into their life book. The women are able to write in their community language and are provided with literacy support when required. Apart from the fabulous range of creative paper and gems/embellishments to choose from, the women can also include photographs and personal documents such as certificates / qualifications. The BME project facilitates a wide range of artistic projects where women can learn and develop creative skills at the same time.